Gather ’round, children, to hear the tale of “The Ghost Who Couldn’t Get It Up”. Intrigued? Of course you are. In Baltimore, teenage Irish-flavoured punk-rock band the Keeley Brothers has interest from two record companies. After playing a showcase, the band parties up big time, downing plenty of beer, “Liquid Stupid”, and – in the case of Logan Keeley – cocaine. It’s a fatal combination, leaving Logan a ghost. His very much alive girlfriend, Aura Salvatore, turns to a new Scottish student for comfort, together researching the night sky and megaliths. It’s supposedly a project for school, but this time it’s personal. But rest assured, this novel is not as cliché as it sounds. In fact, it’s surprising how good this story is, a true testament to Jeri Smith-Ready’s considerable talents. She’s put a fresh spin on ghosts, and intriguing world-building that bloody well better be further explained in the next two books in the series. 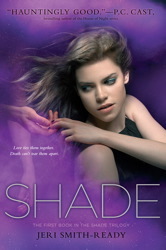 (Shift is out now; Shine is out in 2012.) I’d love to learn more about BlackBoxing, what caused the Shift, and what the megaliths and the night sky have to do with it. 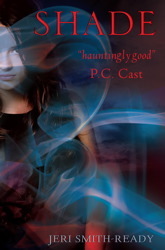 Is this yet another teen paranormal romance love triangle? Yes, it is. Logan is a ghost. Zachary is alive. I don’t really care for either, except I do have a weakness for the Scottish accent. Don’t we all? Done with March 2011 Releases? Here are April 2011 Releases. To see further into the future, check Reading Wishlist. Done with August 2010 Releases? Here are the September 2010 Releases. To see further into the publishing future, check Reading Wishlist.